I was excited to receive “Searching for Paradise” by T.L. Hughes after seeing the cover with the Ford Fairlane and the surfboard strapped to its top. I couldn’t wait to start my journey with Mike, and his two friends. My first introduction began with meeting Mike, and realizing that he and his friends were about to begin a journey to abandon conformity and the 9-5 rat race; to chase their dreams, whims, and inevitably land in England. The author was very successful in painting a vivid setting where I felt like I was journeying across the country with them, especially when they saw the stars in the early morning of the Nevada desert. It also felt welcome, as if you had a seat at one of their old friends table, as they rested, and reminisced. I really enjoyed the personalities the author gave his characters, from the carefree personality of Declan, the fun loving Lucas, and the deep in daydreams and thought, Mike. He reminded me of a young Hank Moody from the show “Californication” without the x-rated behavior. I think this book is good for those aged 20 year olds and up, and for anyone who has a loss they want to run from, a dream to chase, or anyone soul searching. “Searching for Paradise,” reminds me of when I did a journey of self-discovery in my late 20’s. I did some travels, escaped the country, looked within, and started to make friends with myself. I realized just like Mike that the memories I made/will make and the people I knew/know is what paradise really is. As with anything, there are a few issues, quirks, suggestions of how things could have been a little better. I think the chapters could have been longer, and the pages not so full. The font size could have been bigger. It took me a little longer to make it through chapters, because words began to blur due to the small print. I love the stories, and descriptions Hughes gave Mike’s character. I love his descriptive writing; however, it did seem to drone on a bit at times on less than important parts of the story. I do look forward to hitching a ride, surfing a wave, or flying to exotic lands with T.L. Hughes again. He has a gift of painting a story rich in description. Not many authors have the ability to make you feel involved in the story. 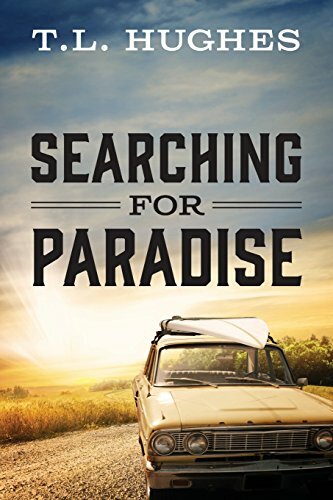 “Searching for Paradise” seems to have something that speaks to our souls, and inner being searching for more, or anyone who wants to go on an adventure without leaving their sofa.